Arlo Mountford, The Triumph (still), 2010, single channel video installation, 16:9 HD, stereo, 9:11 minutes. Image courtesy the artist and Sutton Gallery Melbourne. Arlo Mountford, Walking the Line (still), 2013, dual channel HD digital animation, 4 channel surround sound, 14:37 minutes. Edition of 5. Commissioned by the National Gallery of Victoria for Melbourne Now. Image courtesy the artist and Sutton Gallery Melbourne. Arlo Mountford’s Deep Revolt has hit the road and launches at Shepparton Art Museum (SAM), Victoria on 18 April 2019. Elegantly curated by Gina Mobayed, Director, Goulburn Regional Art Gallery this mid-career survey features key works from the last 15 years which reveal the richness of Mountford’s practice and his wry humour. Working across video, sculpture and drawing, Arlo Mountford’s works are laden with references from art history and pop culture. His animations imagine both real and created spaces from the art world, interiors of iconic museums or the brushstrokes of European masterpieces. Mountford uses the simple figure in his work, a graphic often used to identify bathrooms or elevators on way finding signage. His figures ‘walk’ through carefully selected and painstakingly redrawn works from the National Gallery of Victoria’s collection in Walking the Line (2013) or lose their battle with ‘death’ represented by skeletons wreaking havoc against the living in The Triumph (2010), an animated recreation of iconic moral painting The Triumph of Death, by Pieter Bruegel (1562). The centrepiece of the exhibition, 100 years (2016) takes viewers on a 100 minute journey through 100 significant works of abstract art, tracing the evolution of abstraction, from the zero point of Kazimir Malevich’s iconic Black Square painting of 1915. Deep Revolt reveals the expanse and evolution of Mountford’s practice in both technique and concept. His experiments with sculptural elements and sound design add yet another layer to his work, with ramps and apparatus structuring the viewer’s experience and creating a physical manifestation of ideas touched upon in his practice. The exhibition will also feature a new suite of drawings exploring the viral phenomenon of ‘unboxing’. Alongside these works SAM will present two additional works, Clock (2016) and the panoramic three-channel video work The Folly (2007-9). Following the presentation at SAM and thanks to critical funding through the Australia Council for the Arts, we are able to tour the exhibition to four additional states from Gympie in mid-north QLD and Geraldton in the west to Dubbo, Orange and Maitland in regional NSW and Bordertown in the south. The tour will be accompanied by a new catalogue produced by Goulburn Regional Art Gallery and featuring essays by Dr Oliver Watts, artist and Head Curator, Artbank, Sydney and exhibition curator, Gina Mobayed. Described as a ‘fascinating, funny and unforgiving experience’ Deep Revolt promises to be an amusing and thought provoking journey through the annals of art history. ‘Yet despite its bluntly honest expose of art’s limitations and inconsistencies, Mountford’s work maintains an open and even optimistic engagement with the possibilities for artistic practice … and argues that art still holds the potential to engage audiences and artists alike in unexpected, surprising and inspiring ways.’ Jeff Khan in the catalogue essay for The Flux of the Matter, 2007, Gertrude Contemporary. 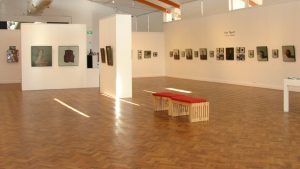 A Goulburn Regional Art Gallery exhibition toured by Museums & Galleries of NSW.